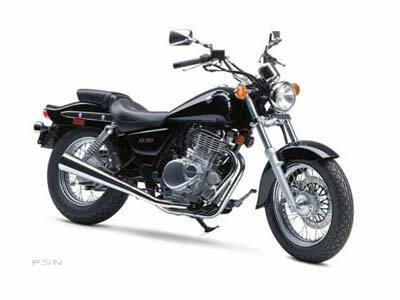 Large cruiser-style fuel tank, rear fender and comfortable two-piece seat with low 27.8-inch seat height. Lightweight (331 pounds) - easier for the beginner or smaller rider to handle. Large 3.4-gallon fuel tank combined with fuel-efficient engine provides ample range for commuting or pleasure riding. Long 57-inch wheelbase supported by oil-damped front forks and preload-adjustable twin-shock rear suspension for a comfortable ride. Fuel efficient four-stroke, single-cylinder, SOHC, 2-valve engine with Twin Dome Combustion Chamber (TDCC). Provides a wide power band, good acceleration and with the simplicity of a single cylinder engine. Single Mikuni 32-millimeter carburetor provides excellent throttle response. Five-speed transmission with gear ratios ideally selected for strong engine performance under a variety of riding conditions. An entry-level cruiser that's affordable and easy to operate, but with many classic styling features of larger cruisers.